KEITH WAYNE SCHROEDER, age 85, lifelong resident of Nobles County, passed away Friday, November 30, 2018, at the Sanford USD Medical Center in Sioux Falls, SD. He was born September 30, 1933, in rural Brewster, where he lived as a young boy. His family moved to a farm north of Worthington in 1943 and he started going to a "town school" riding in a schoolbus-car. During his school years, Keith was active in 4-H and FFA, and was honored to go to National Convention on the Livestock Judging Team. He also was chosen to go to Farm Boys Camp at the State Fair for two years. Following graduation in 1951, he attended Worthington Junior College. He farmed with his family and started working at both of the Livestock Sales Pavillions, which he continued for more then fifty years. Keith married Margaret Berg on September 10, 1955, at the Round Lake Presbyterian Church. As a child he was baptized and confirmed at Trinity Lutheran Church in Brewster. After the birth of their son, Randy, the couple joined St. Matthew Lutheran Church, in Worthington, where he spent many years on the Finance Board, Ushering, and he and Margaret delivered over 500 boxes of shoes for Soles for Souls Shoe Ministry, and making sure their four children were raised in a Christian home. 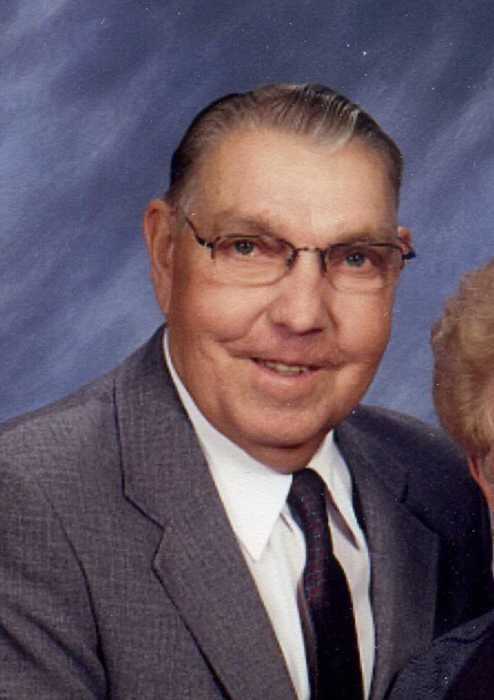 He was a member of the Worthington Township Board for thirty nine years, and State Director of the Minnesota Association of Townships for twenty four years. This was enjoyable for both as they drove many miles of Minnesota roads attending meetings and making countless friends. Keith served as a 4-H Leader for many years, and they were named Farm Family of the year in 1987. Lifelong friendships made through participation in Rural Youth, Circle C and Farmers Club. They were fortunate to travel to Guatemala, Philippines, Germany, Alaska and Bahamas to visit family and friends. They enjoyed hosting international visitors thru Crailsheim Exchange and 4-H.
Keith is survived by his wife, Margaret Schroeder, rural Worthington; four children, Randy (Joy) Schroeder, Beatty, NV; Kathy (Tom) Roycraft, Waseca; Kerry (Barry) Sauer, Lismore; and Ryan (friend, Tammy) Schroeder, Worthington; twelve grandchildren, Scott (Marixa) Schroeder, Jeffrey (Rosa) Schroeder, Kacilyn Schroeder, Emily Roycraft, Benjamin Roycraft, Anna Sauer, Alissa Sauer, Megan Sauer, Morgan Sauer, Dr. Josh (Erin) Schroeder, Matt (Brianna) Schroeder and Dr. Brandon Schroeder; eight great-grandchildren, Scott Jr., Declan, Donovan, Brooklyn, Lucas, Raelyn, Adalyn and Maci; two brothers, Marvin Schroeder, Worthington; and Ralph (Ardella) Schroeder, New Market; two sisters-in-law, Miriam Devery and Ellen (Bill) Johnson; and two brothers-in-law, Norman Atz and Jim Vosberg. He was preceded in death by his parents, George and Anna (Brunk) Schroeder; a brother, Gerald Schroeder; four sisters-in-law, Arline and Corky Schroeder, Karen Vosberg and Marilyn Atz; and a brother-in-law, Glenn Devery. We will all miss him forever. Visitation will be from 3-6 pm Sunday, December 9, 2018, at the Dingmann Funeral Home in Worthington; visitation also one hour prior to the service at the church on Monday. Funeral will be 11 am Monday, December 10, 2018, at St. Matthew Lutheran Church, in Worthington, officiated by Pastor Mark Schreiber. Burial will be in the Worthington Memorial Gardens Cemetery.